Just Who is This Couple? As we start off each episode, so we start off this post. 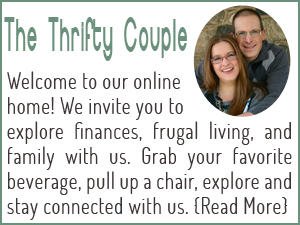 Hi, we are Alex and Cassie – and we are The Thrifty Couple! 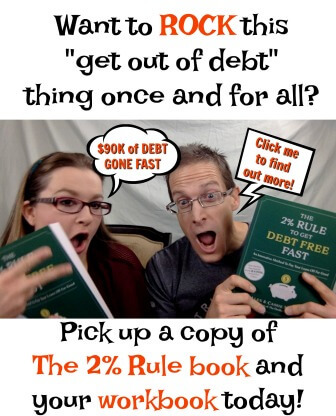 We are the authors of the new book, The 2% Rule to Get Free Fast. Our goal has been and continues to be spreading the message of hope and encouragement that there really is a way out of your debt. Helping families is our passion. Providing hope is our goal. Having fun is mandatory. And learning great financial sense along the way is a natural fit for our Take Back Your Finances Podcast! We have been wanting to branch into podcasting for a long time. When we write a post, we try to add as much of our personality as we can. But unfortunately letters on a screen can only do so much. There’s limitations and the emotions just don’t seem to effectively get communicated. When we can explore a subject, discuss it in real time, and share both of our perspectives, something new happens. You hear more of our personalities, we can more easily share our own struggles, and how we overcame them. You might say it can even get a bit raw at times. But what’s great is we can be real. We encourage you to not just take our word for it. Here’s some of the comments we’ve received so far! Here’s the beauty of it. We talk about finances from every perspective! Sure we talk about debt, but we also share about savings, investing, and everything in between. This really is a podcast to share from our own experiences and what we’ve learned throughout our journey with the world. Well, honestly at least with whoever will listen. We encourage you to check out our podcast episodes and subscribe. If you have been encouraged by anything you hear, please leave your awesome review on iTunes! Doing so will help realize our goal of getting this message of hope in front of more people. At the end of each episode we share our 2% Tip – an actionable tip that you can put in practice today to help shrink your budget by 2% or even increase your income by 2% each month. Remember, the goal of our book The 2% Rule to Get Debt Free Fast is to give you a gradual and sustainable plan to pay off your debt. Oh, did we mention this is the very plan we used to pay off over $90K of consumer debt in just three years? And did we mention we still use it today to meet all our financial goals? This tip will give you that nugget of information to apply today and see your own financial life impacted in some small but meaningful way! Episode 001: Let’s Start at the Beginning – Alex and Cassie – aka The Thrifty Couple – start off their first podcast episode where everything should start: at the beginning. We introduce where we are headed in this podcast and what is means to Take Back Your Finances. Episode 002: Top 33 Reasons Why People Get in Debt – Part 1 – Because paying down debt is already an uphill battle, its important to understand the reasons why people get in debt in the first place. We break down some of the most popular reasons. Check this first episode to find out why! Episode 003: Follow-Up on Why People Get in Debt with Special Medical Debt Focus – You would think this is just part 2 of the discussion. But there’s more – much more! In fact this was so popular because we give step-by-step tips to help you reduce your Medical Debt. Episode 004: Crazy Ideas to Rock Christmas While Staying Out of Debt – This episode may have got a little crazy but that’s why we enjoy podcasting. Yep – we share everything on saving money on Christmas. Finally, Cassie take your through the exact tips she uses to get the ROCK-BOTTOM prices on anything. 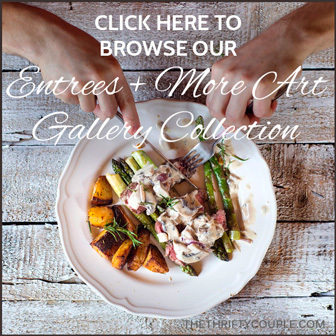 We share how you can make $30 just by signing up for the same tools we use! Episode 005: 8 Critical Financial Moves to Make Before the End of the Year – We promised we cover everything from debt to investing and this episode is proof! We tackle the most important things you need to do before the end of the year to save you money. Episode 006: Everything You Need to Know About Your Emergency Fund – We dare to disagree with the popular author that states you need a $1,000 emergency fund. Find out what you really need and everything else about your emergency fund. Episode 007: 6 Ways One Mom Earned an Extra $3500 of Income Per Month – You won’t want to miss our special guest interview that was actually in studio with us! 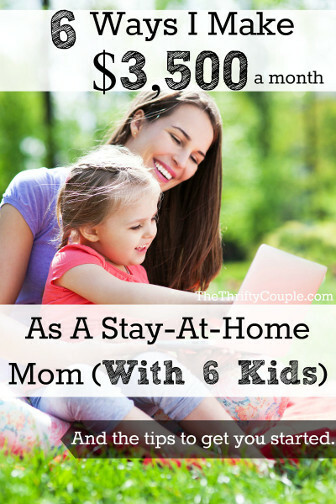 This mom breaks down her tools and tips she uses every day to bring in over $3,500 per month. And wait for the 2% Tip as we have a real treat for you. Let’s just say our family has been crazy about something the last few weeks that we share with you! Episode 008: 5 Proven Ways to Get Your Spouse on Board to Pay Off Debt – This week we address a potentially sensitive subject: Getting your spouse on board with your finances. We share both from the school of hard knocks as well as from our experiences different, proven methods we recommend to either get your spouse on board or make that relationship even stronger! Finally, you won’t want to miss our tips on how to save almost a full 2% decrease amount just on your water! What’s great is that from a few simple tasks you can start seeing continual savings without doing anything else! Episode 009: Interview with Dave Ramsey’s Daughter, Rachel Cruze, and Here’s What She Had to Say – We have a real treat for you! The treat is that we share an interview from a special guest that we recorded over a year ago. That special guest is the daughter of Dave Ramsey and at the time new author, Rachel Cruze! Episode 010: 8 Ways to Set Yourself Up For Automatic Financial Success – This just might be our most popular episode yet! What if we shared that there are just a few tips you could implement today that will get your further in meeting your goals a year from now? This episode was so much fun to record and is packed with tips to get you setup for true success. Plus we end the episode with a tip on how a close friend of ours has been bringing in a good amount of cash over the last few months. We really do hope you love the podcast as much as we do recording it. It’s really a true labor of love as the hours we spend each week come together to make these episodes for you. Share with us your feedback, your questions and you just might find a future episode addressing the exact question you asked. If you want to make sure that you never miss an episode we encourage you to sign up for our Take Back Your Finances Podcast list. As part of this list we will also send you additional resources from the latest podcast episode like checklists or related worksheets to help you implement that weeks topic – only for members of this list! Plus, just for signing up we’ll send you our copy of How to Build Your $1,000 Emergency Fund in 30 Days (a $5 value) just for signing up! If we and this podcast have been a blessing to you in any way, we would greatly appreciate a favorable review in iTunes or Google Play. Our goal is to reach more people with this message of hope and your review will help in doing that. Thank you! !